Sipi Falls is a series of three waterfalls in Uganda and lie near Kapchorwa, north of Mbale. 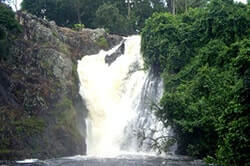 The falls are on the edge of Mount Elgon National Park, near Mount Elgon on the boarder of Kenya. Mount Elgon is a major tourist attraction with comfortable lodges and campsites offering a variety of accommodations. When you visit the area, there are many activities in the area to interest you as a tourist. The Sipi River is named after the Sep, an indigenous plant found of the River banks. Resembling a type of wild banana, Sep is a medicinal plant, the translucent green frond with a bolt of crimson rib is used for treating measles and fever. 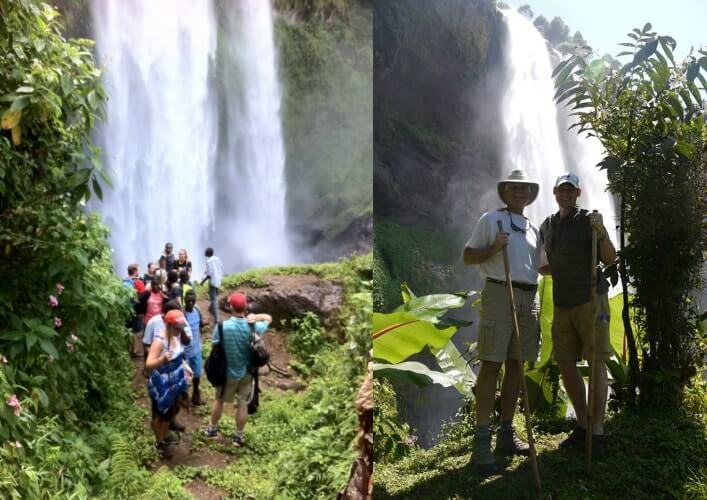 Sipi Falls are a great place to base on to trek Mt Elgon and one can take shorter treks or longer ones, all lasting between 1 to 4 hours characterised by amazing views of the Karamoja plains, Mount Elgon peaks and other waterfalls of the area. 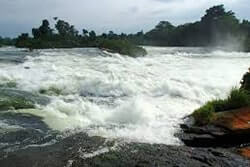 This area of the falls is also famous for the cultivation Arabica Coffee in Bugisu region, growing at an altitude of between 1,600 and 1,900 metres. 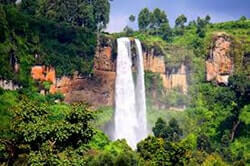 Sipi falls is an attraction for hikers. Mount Elgon has a variety of monkeys and small antelopes, along with elephants and buffaloes that can be seen by visitors. To the keen bird watchers, a checklist topping 300 birds includes many species not recorded elsewhere in Uganda. Other attractions include ancient cave paintings and hot springs within the crater. 1. Sipi Falls Resort, this provides a perfect view of the beautiful waterfall. The lodge with thatched cottages overlooks the wonderful Sipi Falls and Karamajong plains and very conducive for adventuring Mount Elgon foothills and general relaxation. 2. Lacam Lodge on Mount Elgon slopes offers stunning views of the spectacular Sipi Falls. The lodge enables one to walk to the base of the falls and around Lacam village. Accommodation is given in spacious bandas made of local timber and grass. A banda has 2 double beds, ensuite shower and toilet wider private verandas. It also has tents for camping. Tourists can carry tents and camping gear. Read below about other Falls in Uganda. 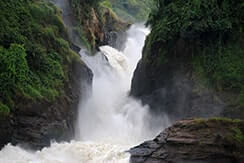 These include the spectacular Sipi Falls on Mount Elgon and Ssezibwa Falls in Mukono district plus Itanda Falls and Murchison Falls along River Nile.